Goats: Part 3 I’ve just had my 47th birthday. I’ve never had children. Can anybody explain why then, when I wake up in the morning, put the kettle on, switch on the computer, poke some life into the remaining embers in the wood-burning stove and then look out the window to see if our two young goats are up and about and waiting for their first bottle of milk, I call down to them, “do the bubbas want their num-nums”? Veal calves and baby goats are a necessary side product of the dairy industry: the mother cows and goats need offspring to stimulate their milk production and then the dairy industry needs their milk. 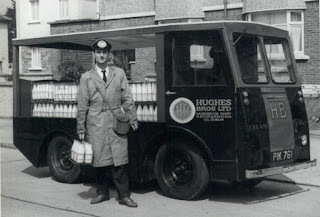 I’d never made this connection when I lived in the city; milk arrived, as if by magic, in almost-silent battery powered floats driven by nocturnal milkmen, only ever seen on a Saturday morning, when they came with the week’s bill. We heard that the local organic goat cheese farm, with a mixed flock of Alpine and Poitevine goats, had surplus youngsters for sale and we picked up two “orphans” to be fed with powdered milk via a bottle, four times a day (but thankfully not during the night). In permaculture terms, an output of one system (the dairy industry) becomes an input of our food system (meat consumption). We plan to give them the best of conditions for their short life; they’ll be ready for slaughter after only ten weeks. We tried them out on the field with our billy goat (see Goats Part 2) and then put them with our three pregnant ewes, until Val contacted us and told us that the goats would have digestive problems if they were being bottle fed and had access to grass. Fed by mum, on demand, goats can get gradually used to grass and other forage, allowing their rumen (one of their many goaty stomachs) to develop. Our intention was to slaughter the male for meat and keep the female, with our other goats, to eventually become a milker. We’ve now learnt that there are different feeding regimes, even different types of milk powder, according to whether the goat is to be kept to breed from or slaughtered early for meat. It’s impossible for us to have a different regime for two goats that live together, so we’ll eat both of these and start again next year. They are now kept in a sizeable pen, with a shelter and straw bed, access to oats and hay and are let out after feeding for a ten minute supervised run around, where they do what most children seem to want to do: find the most dangerous, precarious thing, then jump all over it; they also like jumping over us, once they’ve finished with the bottle—see video. They are looking fantastic! You are doing a really good job there! That little male is a good chunky conformation too....my bet is that goat farm near you has some very good animals! I would visit them again a few times and have a good look at the milkers and the milk records, taking note if they record their goats production and percentages of fat and peotein and 'book' a couple of female kids for next year from a good dam! If all their goats look like that male kid you won't go wrong. I'm just a stray visitor but am very interested in your efforts over sustainable living, have been keen but am still in the city- one of these days..Are you interested at all in a idea called Earth Hour which is a gesture to meet climate change with the idea of turning off all lights for an hour. It is going global, has a site www.earthhour.org., many have registered. Thanks Steve, Val and Julia for your comments. 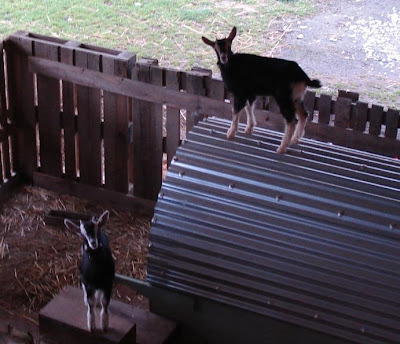 The art of good comedy is all about timing and the same day that Steve expressed his surprise that our goats don't jump over the fence ... they jumped over the fence! We've moved out the pig ark, which they were using as home and launching pad, and have constructed a triangular shelter with smooth sides, which they can still get on top of but can't then jump out the enclosure. I have planks, hammers and nails ready to raise the barrier if needed.